I am writing this in bed, past my bedtime but I have the energy and words to blog so I gotta go for it. We just got back from our family summer vacation to Cancun, Mexico and I am so exhausted but my heart is full. Instead of doing big Christmas gifts each year, my parents gift us some sort of trip and it has been such a fun tradition the past few years. We've done Mexico, South Padre, Colorado, and Mexico again. In fact we talked this week about possibilities for next years trip and it looks like something mountain-y will be the winner. It is just so darn hot in Austin June-September and escaping the heat is so ideal. Back to our trip. We took a direct 2 hour flight (Southwest) from Austin to Cancun, took a private shuttle, and were at our hotel by 2pm on Saturday. 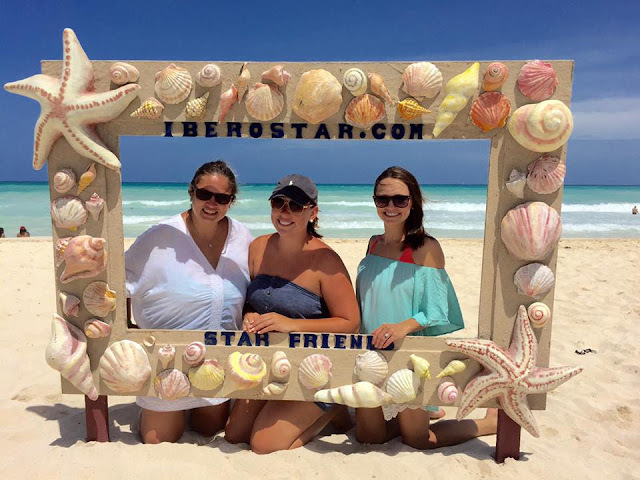 We stayed at the Iberostar Paraiso Lindo which is technically in Riveria Maya but it was only about 30 minutes from the airport. The resort was spot on for families with kids, seriously I could go make this whole post about all they have for kids (while still doing a great job of catering to adults). They had a wave pool, lazy river, big shaded outdoor playground, kids pool, pirate ship/waterslide/splash pad area, nightly shows and events for kids, and a kids club that unfortunately our kids couldn't participate in because they aren't 4 but it looked so cute. In addition to all of that, the kids rode a merry go round on site, had their faces painted, did a pinata, and had balloon animals made. Ford and his cousin Embry had a BLAST! I think this weekend will be quite the withdrawl for him. We ate our little hearts out (the food wasn't the best but not the worst of resorts we've stayed at)... my kids ate pizza, hot dogs, fries, and ice cream almost every meal. You'd think that having napping kids would complicate things but it was actually really nice to lay Lucy down for 2 naps and Ford down for 1 because Jon and I took turns laying down ourselves. It was nice to be out of the sun, take a snooze, or play games on our phones. Our group was a total of 16... our family of 12 and then a family we've known for 20 years, it was so much fun! There were so many extra sets of hands which is seriously the only way to vacation with kids. Ford kept papa busy wanting him to throw him in the air, swim in the waves, etc. To be honest, Lucy was a bit of a handful... she is just very fiesty these days and to top it off, is cutting some major teeth so she was a little high maintenance but still had so much fun getting loved on by so many. I kind of forgot how hard this age is (15 months)... she thinks she's a big girl but can't really talk much and gets verrrry frustrated when she doesn't get what she wants. Don't we all Lucy girl? We were there a total of 5 nights and one of the nights Jon and I got to sneak away to a hibachi restaurant for dinner alone which was much needed after sleeping in a full bed together inches away from our 2 kids. Overall there was lots of awesome family time.. if you haven't noticed, I am very close with my parents and siblings, it is the biggest blessing in my life. The trip was basically a trip with my best friends and we had so much fun. We over ate, over sunned, and some of us (definitely not this lightweight) over drank. What a fun trip! That's great that you got to spend so much quality time with family! What a fun vacation for all of you! 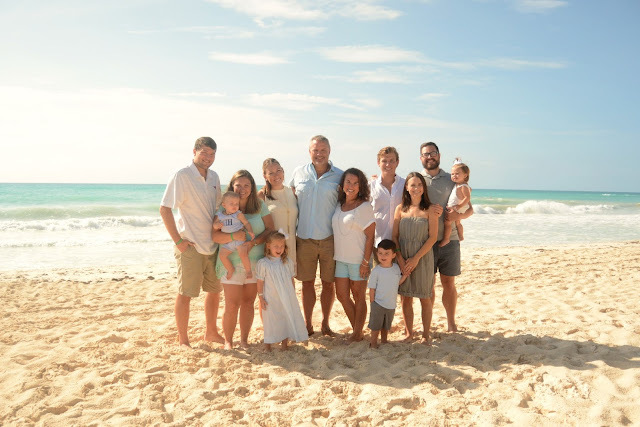 I am so impressed with how well Lucy and Ford travel - and more impressed with how well you and Jon travel with the kids :) Always fun catching up on your happenings and thoughts!